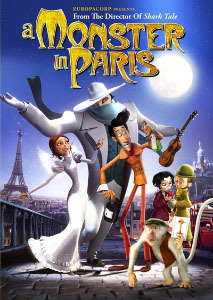 Recently released on DVD in North America, A Monster in Paris (trailer) is a CGI-animated kids' film that originally came out in France in October 2011 as Un monstre à Paris. 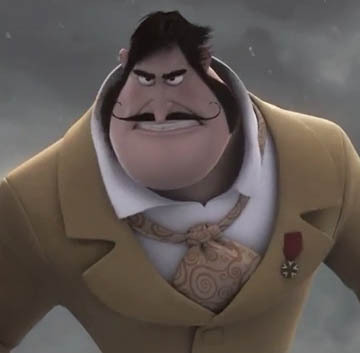 Taking place during the Parisian flood of 1910, the two main characters are Emile, a shy film projectionist and amateur cinematographer, and his friend Raoul, a tinkerer who likes to invent gadgets and operates a delivery service out of the back of his truck. During a late-night delivery to an absent scientist's laboratory, Raoul plays with chemicals, unaware that his tampering accidentally creates a giant flea with a beautiful singing voice. The "monster" is quickly targeted by Maynot, the Commissioner of police, who becomes obsessed with capturing and killing it as part of his campaign to become mayor. He's also taken an interest in a cabaret singer named Lucille, who disguises and hides the flea after recognizing its musical talents. Raoul is an old friend/enemy of Lucille's, and soon he and Emile are in on her secret, trying to find a way to protect the flea from the Commissioner. 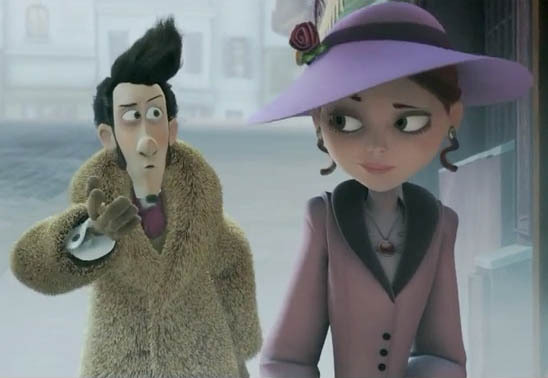 A Monster in Paris is not an especially complex film; it's meant to appeal more to kids than to adults. I thought it was a pleasant distraction, and it doesn't descend into toilet humor or rely on pop culture for its humor. As antagonists go, Maynot starts off as a buffoon but gets increasingly dangerous. His self-absorbed ego is almost as big as Kuzco's in The Emperor's New Groove, so be prepared for rather clichéd dialogue from him. Personally I thought Raoul and Lucille were the most fun people in the whole thing. And the flea, the main source of conflict? Tragically underused. He(?) can't talk, instead he chitters in a cute sort of way. In fact, he can only use words when he sings. Both Lucille and the flea sing at two or three points; the songs are short, few, and fit the mood of the movie without outstaying their welcome. But as a side-effect, the flea never develops any real character. His flea-ness is almost entirely hidden under a giant zoot suit. There's only one scene where the film does anything creative with him, showing the world from his perspective as he leaps from rooftop to rooftop. Otherwise, his role is extremely passive, like a shy, mute alien, a living MacGuffin. Adults will need to suspend their disbelief at how easily he learns to perform on stage, and thank god he never gets hungry; I wonder how parents would explain that to their kids. But you know what - I like the flea. He's a nice guy! 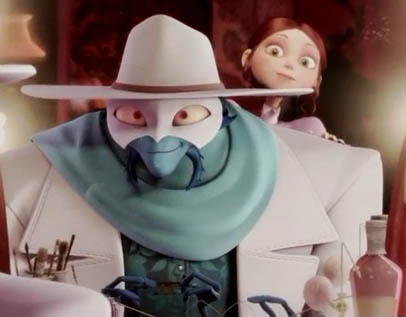 I just wish the film had done more with him, especially since he got top billing, and from a furry standpoint, the zoot suit almost completely obscures his anthropomorphism. 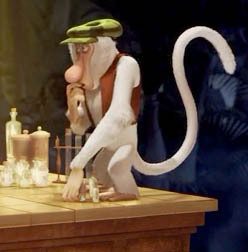 Another underused anthropomorphic character is Charles, the proboscis monkey from the scientist's lab. Normally when a film has a monkey sidekick I instantly feel a sense of foreboding obnoxiousness - but the monkey in this film is surprisingly level-headed, appears sparingly, and is is quite likeable. He's certainly more interesting than most of the female characters. Aside from Lucille's strong independent streak, the few women all fall into pretty typical roles, largely defined by their relations to men. This film would not pass the Bechdel test. The voice acting and the CGI were both good, although some of the body designs were a little cartoonish. Some scenes had very busy backgrounds, others almost none; likely a result of budget constraints on the animation. But really, aside from the furry perspective, I have no major complaints - the film kept me immersed in the story universe. I was amused; it's a decent middle-of-the-road production. Being for kids, this is not a film I'd go out of my way to watch a second time, but if it should come your way, it's entertaining enough to fill an hour and a half!